On a Friday little man has dinner at his childminder’s so when we all get home we have some extra time before bedtime. I decided that we should be intentional about having a planned activity that we do together in this time as a way of kick starting the weekend. This led to Friday Night Baking becoming a mini tradition in our house. Thing with best laid plans and all of that are that you often need to adapt and change depending on the circumstances of the moment. Little man can be exhausted by the time we get to Friday as he has such a super week full of activities and baking just does not work with a tired 2 year old! Saturday morning then became baking time instead as 5:30am starts mean it is perfectly plausible to find yourself making cakes or biscuits at 8:30am. This weekend we didn’t manage Friday or Saturday for baking. This is not a problem, it doesn’t have to become an expectation or a chore to have to do it. The thing is, it is something we all enjoy and for me a measure of a good weekend. The fact that we can carve out some time to work on a project all together and with quick results is something that sparks joy for me. Today I made time for Sunday baking – it was one of our moments. 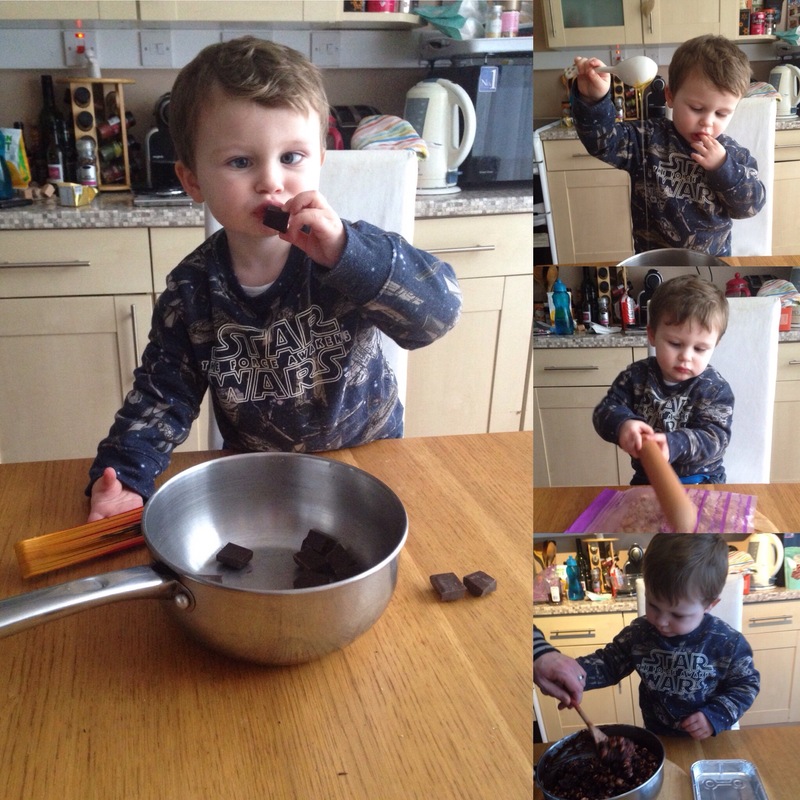 Baking with a 2 year old has its challenges but it is also a great deal of fun. 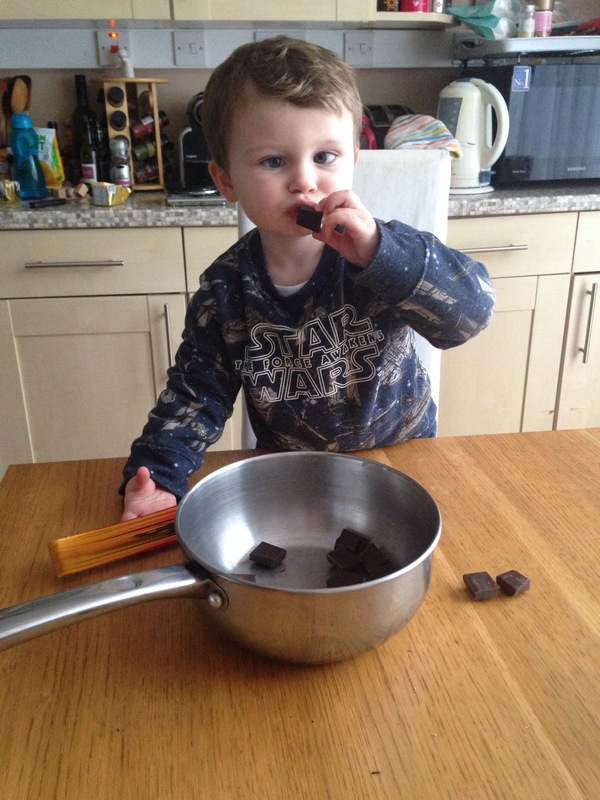 Today we made Rocky Roads. We used Nigella’s recipe which can be found here Nigella’s Rocky Roads as we had no Rich Tea biscuits we used Digestives instead. I use foil trays as they are lighter and easier for small hands to work with and it also means we can make a number of smaller batches. As we made these late afternoon they are chilling in the fridge until tomorrow so no late night sugar consumption issue occur. 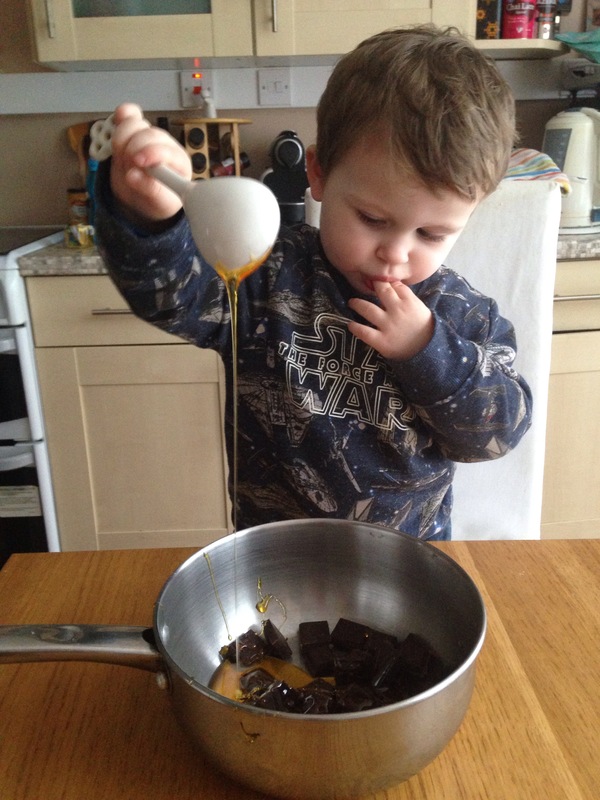 The more we bake together the more I see the progress little man is making with listening to and following the instructions of a recipe. His fine and gross motor skills are benefiting too. Do you have any go to recipes that are quick and simple to make? Or any tips on how to teach cooking skills? I will be posting more of our baking escapades here weekly so let me know of any recommendations. Your son is adorable! 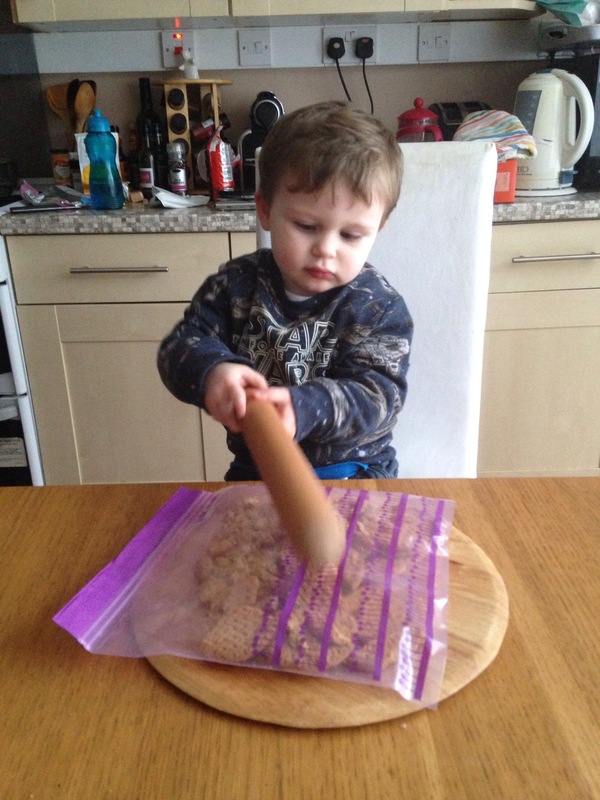 I couldn’t get my 2 year old to keep still long enough to bake lol. Thank you! 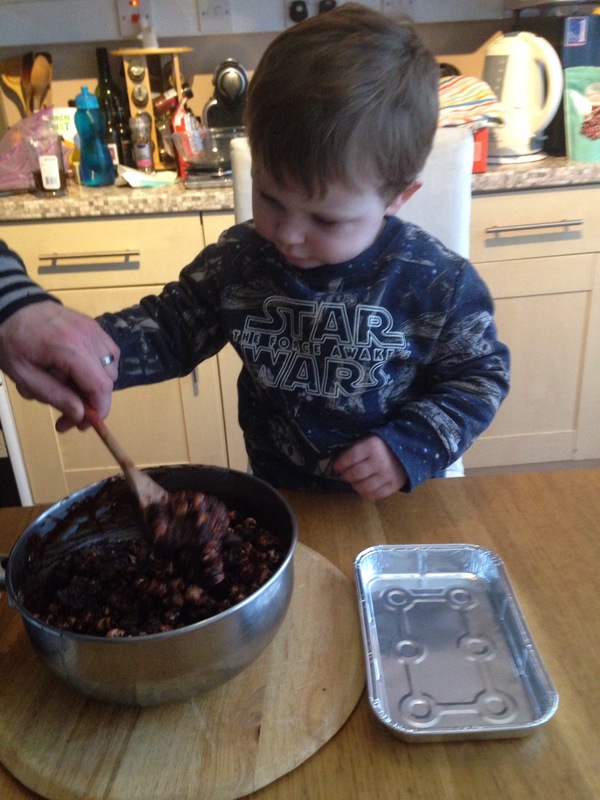 He is a whirlwind but baking seems to spark his interest and hold his attention. We use to plan activities like this every week. Mine have grown now & we are so busy even though we all live in the same home. So what we do is we plan an event or activity that we do together once a month as a family & that’s works great!